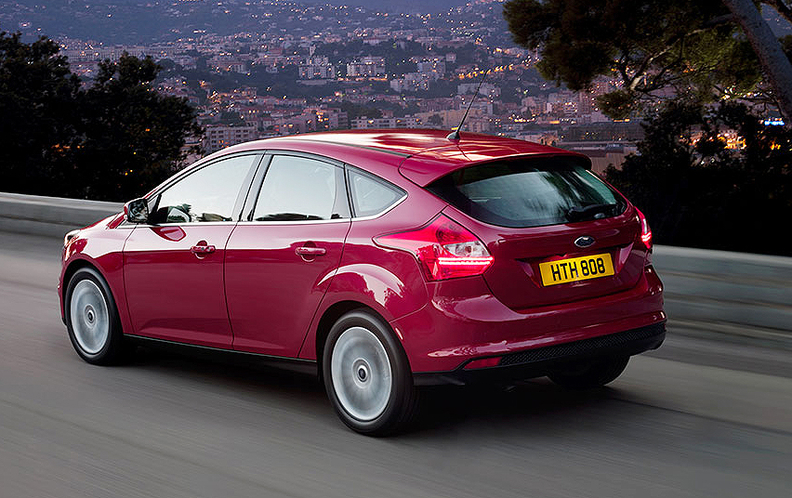 Ford Focus will cost more in UK than in U.S.
Ford hopes the new Focus will boost falling sales in Europe. FRANKFURT -- Ford Motor Co. has announced a UK price for its new Focus. The car will start at 15,995 pounds (about $25,000). Focus prices in the U.S. will start at $16,995 when it goes on sale early next year. The car will launch in March in European markets including the UK, but Ford has not yet announced prices for the rest of Europe. Ford said in a news release that the European Focus will introduce an "impressive" range of high tech features to its segment. Upscale technologies on the European Focus will include an optional low-speed anti-collision system, blind spot detection, as well as parking and lane-keeping assistance software. The car also will have as standard DAB digital radio, Bluetooth and USB connectivity and Ford's Torque Vectoring Control technology, which distributes torque evenly between the front wheels. A Ford UK spokesman said the U.S. and UK market prices reflected different specifications and refinements for different markets. The Focus is "a global car that will be priced for local market conditions," the spokesman told Automotive News Europe. The new Focus is a key part of the One Ford plan to leverage the U.S. automaker's global assets. The compact model will be produced in the U.S., Europe and China and offered for sale in over 120 markets worldwide. The European Focus will come with three gasoline engines, some with stop-start technology, and four diesel engines. The most fuel-efficient engine, a 1.6-liter diesel, will have CO2 emissions of 109g/km. Ford's plant in Saarlouis, Germany, will be the single source for new Focus in western Europe, producing three body styles -- a four door, five door and station wagon. Focus production for North America has already begun at Ford's assembly plant in Wayne, Michigan. Next year Ford will begin to build the Focus in St. Petersburg, Russia, and in 2012, the car will be built at Ford's plant in Chongqing, China. Ford hopes the new Focus will boost its sagging volume in Europe where its new car sales have been hit badly as scrappage schemes have come to an end. In November, Ford's year-on-year European sales were down 14.7 percent to 85,856, according to industry association ACEA.